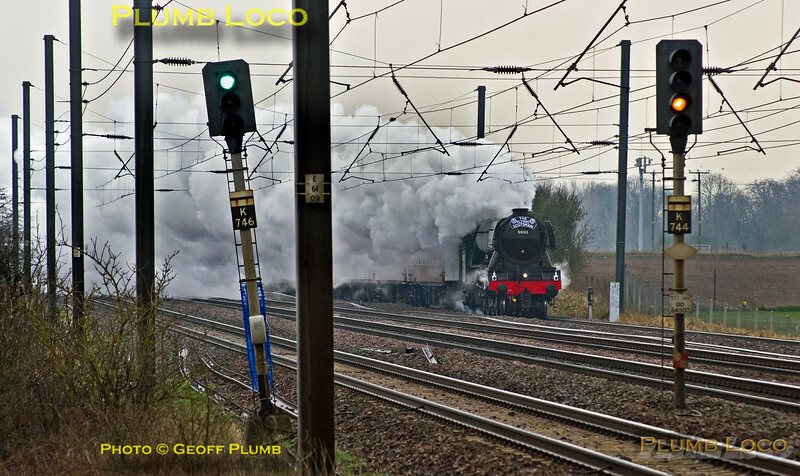 After a bright start to the morning it had completely clouded over by the time A3 60103 "Flying Scotsman" appeared on the down slow at Poppy Hill, Langford, at this stage running around 9 minutes late. Typically, the weather brightened up later as the train headed north... This was the official "inaugural run" after the engine's prolonged restoration, 1Z60, "The Flying Scotsman", 07:40 from King's Cross to York on Thursday 25th February 2016. The wind was not playing ball either, the exhaust steam obscuring the train - can't win them all! Signal K746 seems to need a little help too... Digital Image No. IGMP15028.